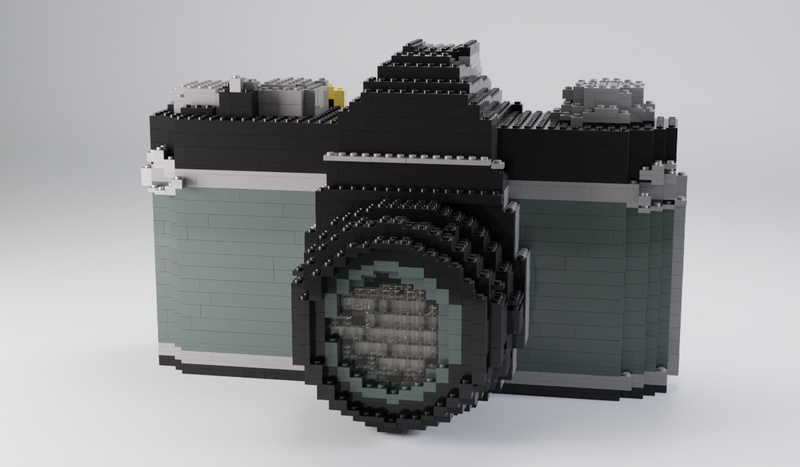 Bricker is an addon for Blender that converts any 3D Mesh into a photo-real 3D brick model. You can also use Bricker to generate animated brick models from keyframed animation, simulations (such as fluid, smoke and fire, or soft-body animations), armature, and much more. 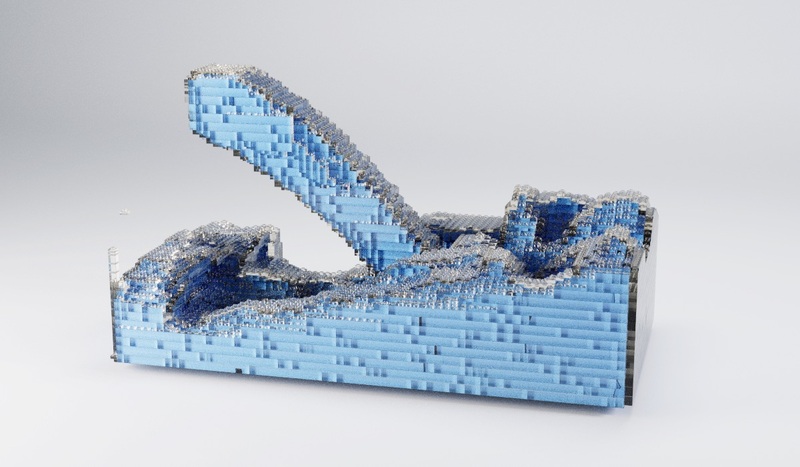 With this addon, modeling and rendering a 10,000 brick sculpture is simply effortless. Once you've created a 3D mesh, a simple click of a button will convert it to a brick sculpture of any scale or orientation. Choose the level of detail (underside, customizable logo, bevel, etc. ), materials (source object materials/UV colors, random, custom material, etc. ), randomized location/rotation (to mimic real life imperfections), brick type (including bricks and plates, slopes, studs, cylinders, cones, and even custom objects), shell thickness, brick size, connectivity/sturdiness, internal support structure, and so much more with the simple and intuitive UI. NEW in Version 1.1 – You can now customize the auto-generated model with handy tools like split bricks, merge bricks, change brick type, add adjacent bricks, and more! NEW in Version 1.4 – You can now brickify smoke and fire simulations! Customize the smoke density, fire color, and fire intensity for exactly the look you want. The results are truly stunning. The possibilities really are endless – we're excited to see what you'll create! Bricker comes packed with functionality that makes rendering photo-real brick models effortless. Every brick was designed with both efficiency and realism in mind – you get to choose the number of stud vertices, the level of detailing on the brick underside, the bevel width and resolution, the amount of minor variation in position/rotation, and much more – all optimized with smarter, cleaner brick topology than any 3D brick exporter on the market. NOTE: Combine Bricker with our ABS Plastic Materials for a full library of materials based on the LEGO® brick color pallet. Bricker was built to accommodate the workflow of an artist. Every brick model is optimized and cached for fast generation and even faster updates, and with the power of a background processor, the calculations won't interrupt your workflow. The fluid model you see below was generated in under 5 seconds on a Mac laptop. The built-in mesh generator is memory efficient and able to produce millions of bricks without requiring massive amounts of RAM, with many features including object instancing and selective detailing at your disposal. Rigorously tested and extensively optimized, this addon is built for speed. 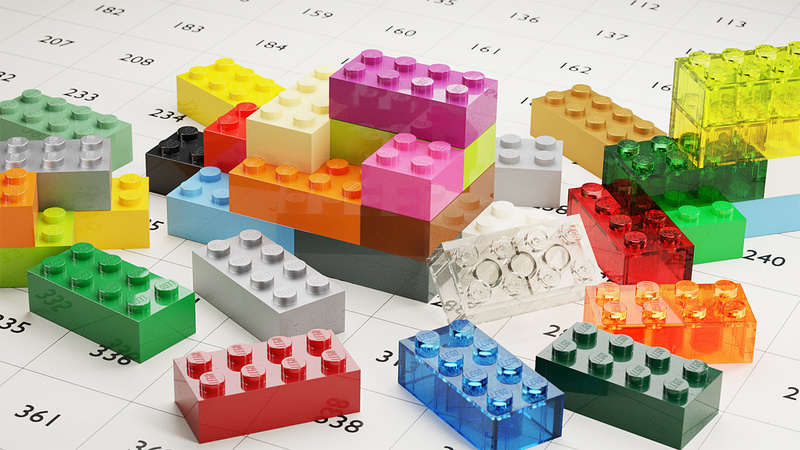 We designed Bricker to be useful for real-life sculpting with LEGO® bricks as well. Choose the maximum brick size for your model (e.g. 1x8, 2x10, etc. ), set the thickness of the outer brick shell, customize the internal support structure (cross-beams, lattice or columns), and generate the model. You can adjust the connectivity threshold to ensure your whole model is sturdy and inter-connected. Once the model is finished, export it to any LDraw compatible program so you can download the instructions and build it in real life! NOTE: When combined with the AssemblMe addon, you can also generate a step-by-step build animation in Blender to help you construct it. Bricker can also be used to generate sculptures from any mesh object imaginable! Bricker is useful for any creator, from Lego stop motion/CG animators (like our developer, Christopher Gearhart of Bricks Brought to Life) to Minecraft artists and other Blender enthusiasts alike! 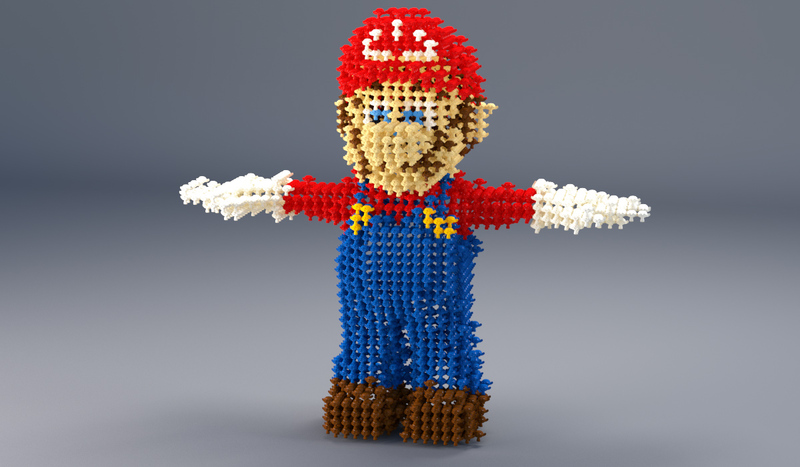 Ever wondered what Mario would look like if he were made out of Suzanne Monkeys? Look no further! Again, the possibilities are endless. Send us your creations/renders if you'd like to be featured here; we'd love to show off the awesome creations you're able to make! Added the option to disable object instancing in the 'Bricker > Advanced' tab. Bricker is now up to 2x faster for all models! No more pesky exposed Bricker groups to get in the way of your workflow! You can now export your Bricker models to the LDraw (.ldr) file format! Added support for texture maps! You can now transfer UV image colors from the source object to your brick model. Added ‘Bricks and Plates’ mode – you can now generate models with the best combination of both brick types. Greatly improved model quality (now fits source mesh form more accurately). New “Customization” controls for adding new bricks, splitting and merging existing bricks, etc. Deleting individual bricks is now dynamic - the model will update around you as if you were working with real bricks. Begin by creating or importing a 3D Mesh object in Blender. For best results, make sure your object is a single, water-tight mesh. Follow all of the steps you would normally take to create the animation or simulation you want converted to bricks. Open up the Bricker tool panel from the 3D viewport by pressing the 'T' key and selecting the 'Bricker' tab on the far left. With your 3D mesh selected, create a new model with 'Brick Models -> New Model' and name it whatever you'd like by double clicking on the name in the models list. Customize your brick model by adjusting the parameters and various options for a specific result. Click 'Update Model' after making changes to commit your adjustments. 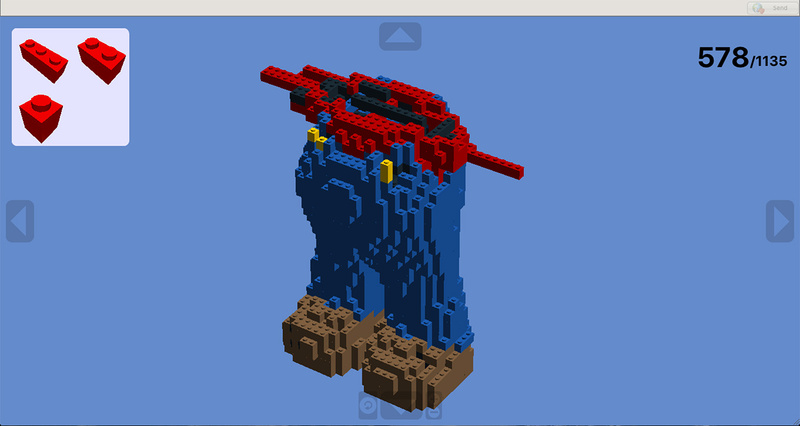 If at any point you wish to view or edit the source object after the brick model has been generated, simply click 'Brick Models -> Delete Brickified Model' and the source object will return to view. If you want to edit the topology of your brickified model, we recommend first baking the model in the 'Bake/Export' dropdown. This will convert your Bricker model into a standard Blender object that can be edited as you would any other object. Keep in mind that you will no longer have access to the Bricker menu options for this model. NOTE: Before animating your model with the AssemblMe plugin, you'll need to split the model into separate objects by clicking 'Bricker > Model Settings > Split Model', then 'Bricker > Brick Models > Update Model'. You can download Bricker from your account dashboard on the Blender Market, assuming you’ve already purchased it. The easiest way to install Bricker is to do so directly from Blender. You can do this by going to File > User Preferences > Add-ons > Install from File. This will open a File Browser in Blender, allowing to you navigate to and select the .zip file you downloaded. Press Install from file. If your browser auto-extracted the downloaded .zip file then you will need to re-compress Bricker folder before installing. Once installed, Blender should automatically filter the addons list to show only Bricker. You can then enable the add-on by clicking the checkbox on the upper right of the add-on panel. Updater Settings – Addon updater developed by CGCookie. Refer to the built-in tool documentation by hovering over the options and waiting for the tooltip to appear. Is Bricker compatible with Blender 2.8? Yes, Bricker works perfectly in Blender 2.8. You'll find it has a new home in the right-side tool panel in the 3D viewport! NOTE: Blender 2.8 is still in Beta, and every day a new build is released which could introduce compatibility issues with Bricker. If you run into an issue, first make sure you are using the latest 2.8 build from blender.org. If the issue persists, be sure to report the issue in an email to [email protected] and we will address it right away. How can I reach the developer for support? Please, don't hesitate to send an email ([email protected]) or private message from your inbox (https://blendermarket.com/inbox) if you've encountered an issue, need help using the add-on, wish to submit a feature request, or for any other reason. We'll get back to you within 24 hours! How do I get the newest version of Bricker? The easiest way is to Log In to the BlenderMarket, go to your Account, then under the Orders tab you should see Bricker in the list, which should have a link on the right-hand side to download the newest version. If you are on a PC or Linux system, you can also update via the addon preferences for Bricker within Blender (Addon updater coming to Mac OS in Blender 2.8). Does Bricker support OSX and Linux? Absolutely! Bricker works like a charm on Windows, Mac OSX, and Linux alike. Will there be free updates? All updates are free! Bricker is frequently updated with additional colors and other features, so keep your eye out! This item has an average rating of 5 from 13 ratings by the community. Being completely new to Blender I have been trying to find new and unique ways to implement my 3D work into compositing and After Effects while learning the 3D process at the same time. So I picked up Bricker and AssemblME and I haven't looked back. Both programs are very intuitive and simple to use even for someone as day one as me. Great product will certainly be using it where I can! Christopher has been so fantastic, responding to any questions I have had. Very Pleased to add this to my add-ons! Thanks for the great review Benjamin. Always happy to help! This is an *amazing* extension. The author has clearly put a lot of work into it, responds to support requests and updates keep coming. Combined with AssembleMe, I've created some really cool stuff. The only thing missing is documentation. I have no idea what some of the controls do and was very frustrated the first time using it b/c all I would do was tweak settings hoping to figure out a solution. As a software author myself I know that a product is only complete with proper documentation, so when the author creates it, I'll very happily up my rating to a 5. [Update 2019] The author has added documentation to his already fantastic product. It's a 5 star add-on! Thanks for the great review Jaan - I’m happy you‘re enjoying Bricker and AssemblMe! Really fantastic looking and is working like a charm on OctaneBlender. Thanks for the great review Richard! The Bricker is an awesome add-on and easy to use. The author is very helpful, which means a lot if someone is a rookie... Many thanks!!! That's great to hear! Happy to help! Just bought and I am already happy with the stunning results. I also got the "plastic material library" and I am encountering a lot of "cuda crashes"
I, until now, just applied some material of the library on a bricked model and it crashes. Some tips to know about it? Thanks for the great review! I'd be happy to provide support via private message on Blender Market or via email – reviews aren't the best place for this as I am only allowed one response. It sounds like your graphics card may have run out of memory – please send me a support request via your inbox, https://blendermarket.com/inbox and I'll be happy to help you troubleshoot further. after trying all kind of way to generate lego constructions under 3ds Max or with stand alone software I was left to a conclusion : I can't get, fast, realistic big lego constructions generated... Until I discovered Bricker & Blender !! Ok I had to learn blender but this totaly worth it!! fast, responsive easy perfect looking looking lego constructions!! Just does everything I've been looking for and even more! Thanks for developing this ! I'm excited to hear that Bricker brought you into the Blender community! Thanks for the review Alex! An amazing addon! I love they way you can make Lego smoke from this especially. I've always like rendering my LDD models and such so I do find this particularly enjoyable. I'll always be looking forward to new updates and videos. Keep it up! Thanks Sam! That's great to hear and thanks for the rating. Fantastic addon that saved me many hours on my current project. Flexible, fast and stable. Keith, I'm happy you enjoy it and see the potential! As soon as Blender issues the call for developers to update their addons to support 2.8, I'll be one of the first to do so. Thanks for the rating! I think you'll really enjoy the new features just released in version 1.4 (smoke and fire support, multiple custom objects, significant speed boosts, and more)! I have been looking for this for 2 years. Works as described has loads of potential. Would be nice to have a short tutorial for the animation part as the youtube video goes too fast. I'm glad you like it Christopher! I'll be putting together a few helpful tutorials soon. Keep your eye out – I've got some exciting improvements in store for Rebrickr (check out v1.1 if you haven't already – I think you'll love the new features).